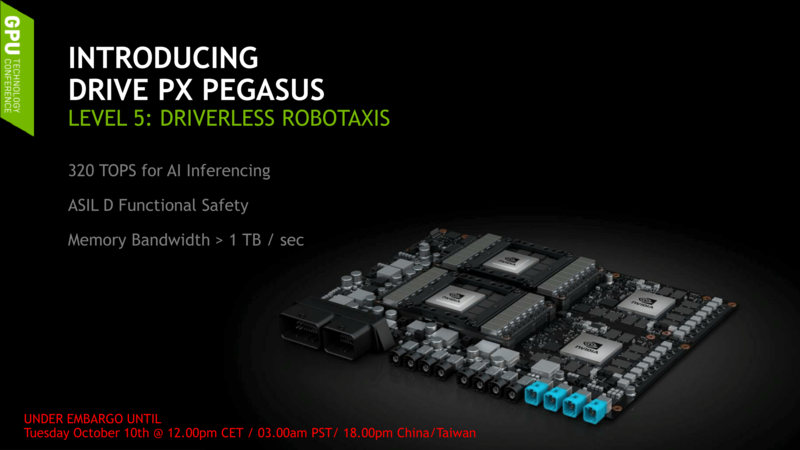 At GTC Europe 2017 in Germany, NVIDIA today has announced the Drive PX Pegasus, a new entry to the Drive PX family of computing modules for self-driving cars. Building off of the previous Drive PX family members, the Driver PX Pegasus is intended to be the next step in self-driving hardware by being the company's first Level 5 system, meaning it's capable of supporting fully automated driving for fully autonomous vehicles. Put succinctly, this is the holy grail of what NVIDIA has been building towards over the last few years. The Drive PX Pegasus is very much a forward-looking product. While NVIDIA is announcing it today, they won't even have dev kits available until later next year, and any kind of commercial release is farther off still. Consequently, the specifications for Drive PX Pegasus are equally forward looking: the board features two unannounced post-Volta next-generation discrete GPUs, which will be doing most of the heavy lifting. To put this in context, NVIDIA has only just started shipping Big Volta (GV100) for compute products, and smaller scale Volta GPUs are not expected until 2018, so we're looking at something quite far into the future. Meanwhile, rounding out the package and serving as the hearts of the Pegasus will be a pair of NVIDIA's upcoming Xavier SoCs, which combine an integrated Volta GPU (complete with tensor cores) with an unnamed octa-core ARM CPU design. With the Drive PX Pegasus, NVIDIA is targeting commercial applications in robo-taxis and driverless long-haul. 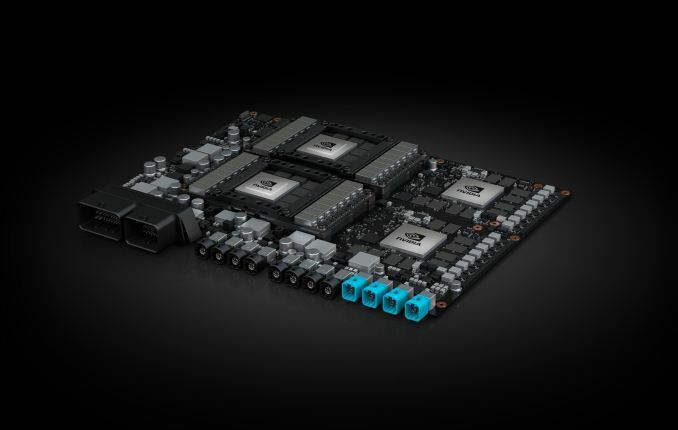 It will, in turn, coexist with the to-be-launched Drive PX Xavier, NVIDIA's previously-announced small-scale self-driving hardware that essentially packs Drive PX 2's capabilities into a small 30W board and features a single Xavier SoC. Drive PX Pegasus, by contrast, is essentially a next-generation Drive PX 2, utilizing much more powerful SoCs and GPUs than before. NVIDIA has stated that Drive PX Pegasus will be air-cooled, although it's likely to be right at the edge of what's reasonable. WIth a 500W TDP, NVIDIA is pushing the envelope on performance in part by packing so much hardware into a single board. Not that a car will have any kind of trouble delivering that kind of power, of course, but it's quite the interesting change in car design when we're talking about significant amounts of power being dedicated to a non-mechanical operation. Getting back to the tech specs, of the few details given, the Drive PX Pegasus possesses 320 TOPS of AI inferencing and combined memory bandwidth of over 1 TB/s. Designed for ASIL D certification, PX Pegasus automotive input/outputs include up to 16 cameras (6 of which are lidar). In addition, next-generation GPUs include NVLink and will come in the SXM2 mezzanine form factor also seen with Tesla V100 (as opposed to MXM like the PX 2). While TSMC remains the foundry of choice, the exact process node was not disclosed, although for the Xavier SoC NVIDIA previously announced that they were using 16 FF+. Particularly for the next-generation GPUs, no other information was given, despite being the first official and public reference to any architecture past Volta; on that note, NVIDIA has not yet revealed any detail of consumer Volta. At 320 TOPS for a dual GPU plus dual Xavier system, this works out at 130 TOPS per GPU (the Xavier SoCs are already quoted as 30 TOPS at 30W). Meanwhile on power consumption, with Xavier already speced for 30W each, this means we're looking at around 220W for each GPU. In other words, these are high-end Gx102/100-class GPU designs. Coincidentally, this happens to be very close to the TOPS performance of the current Volta V100, which is rated for 120 TOPS. However the V100 has a 300W TDP versus an estimated 220W TDP for the GPUs here, so you can see where NVIDIA wants to go with their next-generation design. SoCs 2x Xavier Xavier 2x Tegra X2 "Parker"
(512 CUDA Cores) 2x Parker Pascal iGPU & 2x GP104? Rounding out the specifications, NVIDIA has told us that Pegasus units will be air cooled, not liquid cooled like the 250W Drive PX2 systems. Meanwhile as part of the Pegasus system, NVIDIA has stated that these also need to support failover, but how the failover occurs (either by NVIDIA hardware or other) is up to separate customers in their designs. In terms of availability, PX Pegasus development kits will be available for select automotive partners in the second half of 2018. However it was not clear if this sampling involved full dev kits with prototype-grade silicon, or an emulation-style system with current-generation hardware to kickstart development. Otherwise, given the long testing and validation cycles in the automotive industry, Drive PX Pegasus may not show up in vehicles for several more years. Last year NVIDIA announced their Level 4 autonomous hardware, but we are only now seeing Level 3 vehicles being showcased in early development for deployment, emphasizing that embedded time scales are much longer than consumer hardware. NVIDIA has stated that their automotive platforms are designed for typical embedded-level longevity, in this case their 'minimum' is a decade of use. Finally, it's worth noting that this year’s conference is just the second annual GTC in Europe, and going forward NVIDIA has confirmed that GTC Europe will be NVIDIA’s primary automotive-related event. In that vein, NVIDIA has also announced a partnership with Deutsche Post DHL Group and ZF in testing autonomous delivery trucks, starting in 2018. Exactly. With automation the price is about replacing squishy meat-bags, not about what the costs of similar silicon are. When a sentient breeder costs $30-60K/year (not including benefits, time off, hour labor restrictions, etc) and a chip and sensor suite costs a mere $20-50K lifetime, then it becomes a no-brainer decision for fleet vehicles to justify the costs. Everything gets covered int he first year, and then everything after that is just savings.